Car Pretty LLC - Truck Fender Trim - Stainless Steel, Black Powder Coated, Exact Direct Fit. 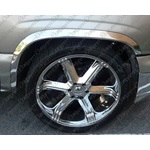 Truck Fender Trim - Stainless Steel, Black Powder Coated, Exact Direct Fit. Stainless steel direct fit truck fender trim and Stainless black powder coated direct fit truck fender trim.